Filed Under cats, Dogs, gifts, Holidays, what'd ya get? We had a wonderful Christmas. Thank you for helping to make it special with your cards, your gifts, and your warm wishes. Rumpy is happy he got a dinosaur chew toy and doggy cheese! Enough of the posing; let’s get to eating! The kitties got a new climbing tower and are impatiently awaiting me to put it together for them. Who knew Santa didn’t include assembly? At least I have these to tide me over while I wait. 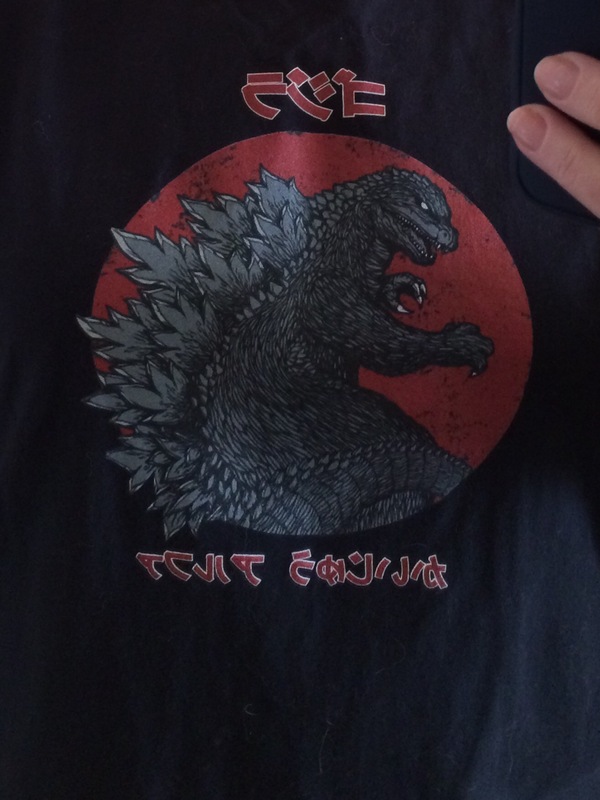 Yours Truly is sporting a tee with none other than Godzilla on the front! I love it and that’s one shirt not everyone will be wearing, I’m sure. I don’t read Japanese, but I’m told it says something about the Alpha of all monster movies. And now it is time to look back on what I’ve learned in this year and plan resolutions for the next. Happy Boxing Day, or, if you live in the US, happy standing in the returns line day! Thanks for the Doggy Cheese! It’s my favorite!!!! Our kitty, Chi, found the dregs of eggnog Santa left behind when he dropped off our gifts. She kept going back to help herself to it, over and over again throughout the day. She ended the day by catching a mouse. Was not happy when we interrupted he feast.Oy! However, she’s very happy with the treats and toys Santa left in her stocking! Looks like a wonderful holiday. Enjoy. oh wow… cheese and a dino… you can make a dino cheesecake Rumpy :o) happy Boxing Day!!! Boxing Day is June Buggie’s favorite holiday!!!! Glad you all had a purrrrfect Christmas!